Patient care is your primary concern, as it should be. Building a vibrant practice so you can focus on patient health and wellness is no small feat. There is little education provided to acupuncturists on the specific tactics for marketing your own private practice. Yet, a simple Google search will show an overwhelming amount of advice to help and an equal amount of competitor practices. Lhasa OMS is here to help. We know marketing and are happy to share tactics that will help you grow your practice. In this blog post, we will focus on Search Engine Optimization (SEO). SEO should be the foundation of any sound small business marketing strategy. The simple tips below will help ensure your website can be found on Google when relevant searches are conducted. 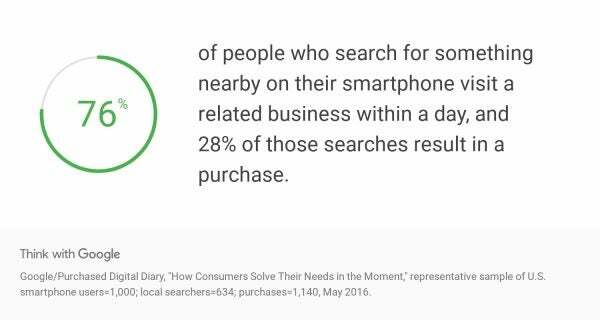 According to Google, 76% of people who search for a local business will visit that business within a day. Pretty convincing data. How does it work and where do you start? A good SEO strategy will make sure that Google shows your website to the right audience. Google bases all decisions on their searcher’s experience. They want everyone who searches, to find what they are looking for. Businesses with websites can influence search results. Google does not care about the number of keywords you have in your article; they care about their users being satisfied with the information you provide. Therefore, it is a great tactic to understand what your audience is looking for based on the current market trends. There are actually two types of competition to consider when it comes to Google search results. Most businesses (large and small!) overlook this. You have direct competition. This would be other practitioners competing for the Google searcher’s time. Then you have other businesses competing for those search terms as well. You may not think of them as competition, but they are in this arena. We can learn from companies that receive high rankings. There are digital clues that we can use for our own SEO strategy. Other SEO experts will speak endlessly about different methods to make yourself sound like an industry expert. Thus diminishing the amount of personal voice on your website copy and blogs. Unfortunately, this tactic will end up hurting you in the long term. Speak in terms your prospective patients will understand. Be genuine in your tone and it will set you apart. The more high-quality content you have online, the higher the chances are of your patients finding you. A blog is an easy option. There are inexpensive ways of integrating a blog into your website. In our experience, adding a blog to a website will increase your traffic simply because people are curious about many different topics. 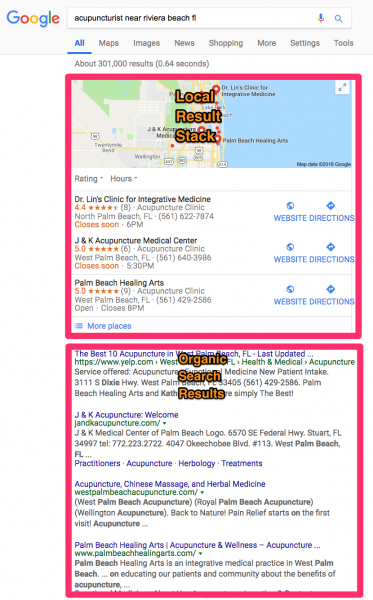 Understanding what keywords patients are using to find acupuncturists is critical. This will be the foundation of an SEO strategy. Finding those keywords are as simple as researching your competition, and using free tools such as kwfinder.com will help. Also, keep in mind implicit vs. explicit searches. This means searcher intent could be different and search results will be different. 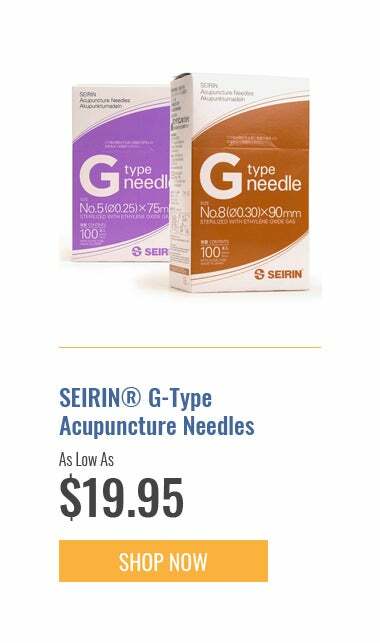 If someone types in “acupuncture”, they may just be doing research. If they search for “acupuncturist near me” they are more likely to be a prospective patient. No need to go crazy. Focus on 5-10 of the most relevant search terms. It starts with Google My Business. 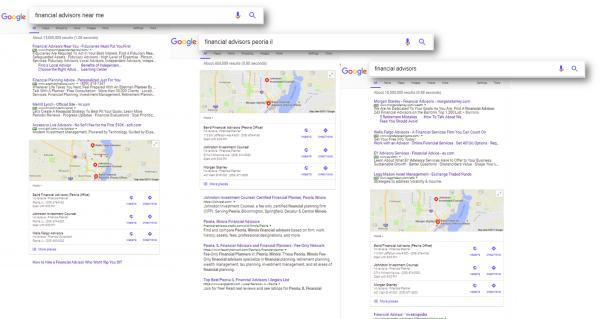 Local searchers are primarily looking for a business’s address and location, and this free tool enables you to put your NAP (name, address and phone number) and other business information (such as hours and directions) on Google Search and Maps. Encourage reviews from your patients whenever they have a good treatment experience. This tip doesn’t necessarily qualify for search engine advice. However, good reviews will provide positive confirmation for future customers. We will have a future post on digital “reputation management” to expand on this idea. Optimize your URL, tags & content. This is the only technical aspect about which to think. Your URL, title tags, headers, meta descriptions and content should include your city or region and the target keyword of the page they describe. This tells Google what geographical location the page is relevant to and what content is on the page — and it helps them index your page accordingly. SEO is a long-term process, do not expect results within the first couple weeks of implementation. I continually learn, adapt and optimize. A long-term approach will bring sustainable long-term results. 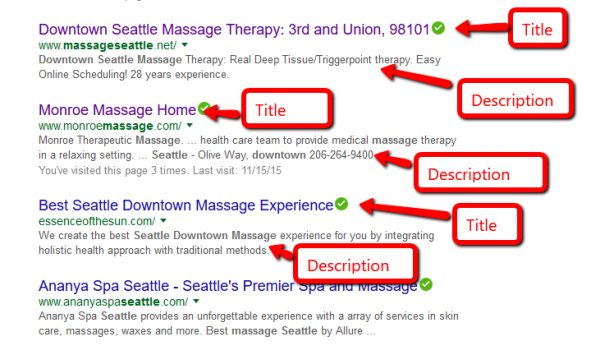 PPC or Google Adwords can bring direct people to your practice website and results. In many locations there appears to be little competition, so costs should be low. It can be a quick way to be found in your area. Please contact us at [email protected] if you would like additional information or have any questions. We are here to help.